It's little more than a year since we first encountered Mark McKillop from Pambula Oyster Co. Initial contact via Instagram, while he was at the Royal Melbourne Show technically showcasing his gold medal winning produce but seemingly spending more time making connections with the country's brewers, led to a visit to his shed on Pambula Lake and a beer-for-oysters swap. 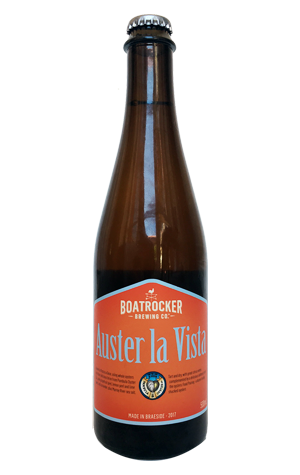 He spoke of his love for great beer and desire to get more involved with the industry and he's certainly done that, with appearances at beer dinners and festivals and this his second collaboration with Boatrocker Brewery. Following winter's stout, this is a gose, a style for which oysters' natural briny character is well suited. Here, the whole oysters are joined by pink grapefruit peel, lemon peel and lime peel plus coriander and Murray river salt. Much to our surprise, given all that's involved, this pale gold, headless, lightly carbonated beer reminded us most of a chardonnay – certainly on the nose and with a vaguely vinous body too. On the palate, there's plenty going on but in small and subtle doses: some malt sweetness, a touch of tartness, hints of the citrus additions, some prickly acidic carbonation and back end saltiness. Yet it all comes together in a beer that presents more simply than the sum of its parts might suggest.